Robotina is a Slovenian company, which was founded in 1990, being intensely focused on the innovatory aspect of automation and control technology. By using their Internet of Things (IoT) enabled hardware, cloud software and other various technological solutions, the company has proved that it has only provided quality services in many different industries. Robotina’s employees have years of experience in their respective fields and business connections. Robotina has been involved in partnerships with big companies, Hitachi & Panasonic being just one of the names they have collaborated with. The Robotina Platform will be a vertical, high-tech all-inclusive enabling solution, comprising of connected Internet of Things (IoT) elements and the Power Platform (PP). It will utilize Smart Rules, Artificial Intelligence and Blockchain technologies. The platform will run on cloud servers. The company has already tested, demonstrated and validated, that up to 10-20 % can be saved by using the latest and most advanced technology, which is now attainable and practical. Robotina aims to create a connected community, whose members will benefit by saving a considerable amount on energy costs, generate relevant earnings as well as contribute to a greener environment and sustainable development by optimizing energy consumption and consequently reducing emissions. Cybro-I, II and III (Q1/18): is a distributed control system equipped with all the necessary hardware and software, making it very suitable for customizing and adapting solutions to any potential challenges that may arise. It’s the first IoT programmable controller. SMIP: Cloud (SaaS) is the platform that enables this technology, communicating securely with Cybro controllers to overcome the gap between controllers (real world) and Internet (virtual world). Thus, such technologies have opened a new path for vertically integrated solutions (from sensor to Internet and viceversa). The Robotina Platform will be crypto-friendly, making use of the Robotina Utility token (ROX), the platform’s native token based on Ethereum, for all its internal transactions. The token will enable the user to acquire services and products sold on the Robotina platform with other cryptocurrencies, tokens or fiat currencies. The user will only receive a special discount of 3% when paying with ROX. Other means of payment will be converted into ROX and the rewards will be shared with the community. Users will be able to use Robotina Utility Tokens (ROX) to take part in crowdfunding of the pro table projects using ESCO or VPP schemes. Awareness and control – Energy Management System (EMS), HIQ-Home and other IoT that are connected to the platform will help users monitor and manage their sites and IoT and control them at any given time or place. Energy efficiency and Dynamic energy pricing – through analytical tools, remote control, advanced rules, multi-objective optimization and artificial intelligence, the user will obtain a fast ROI (Return on Investment), saving more than 20 % on their energy expenses. Users will also help reduce CO2 emissions and enjoy tax benefits. Security and safety – all potentially threatening and dangerous situations will be detected by artificial intelligence and the user will be notified. Energy efficiency: Large consumers and corporate users who will connect their establishments to the Robotina Platform, will reduce their energy consumption and maintenance expenses by an estimated 30 %. 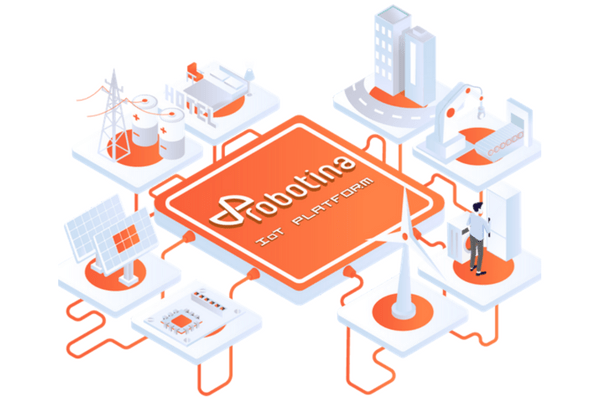 Robotina is devoted on becoming one of the leading providers of smart connected solutions, components and platforms, which will change the way the world manages energy.